The Republican primary to replace retiring U.S. Rep. Lamar Smith, R-San Antonio, has drawn 18 candidates — a staggering number that has created an early urgency to stand out in the crowded field. 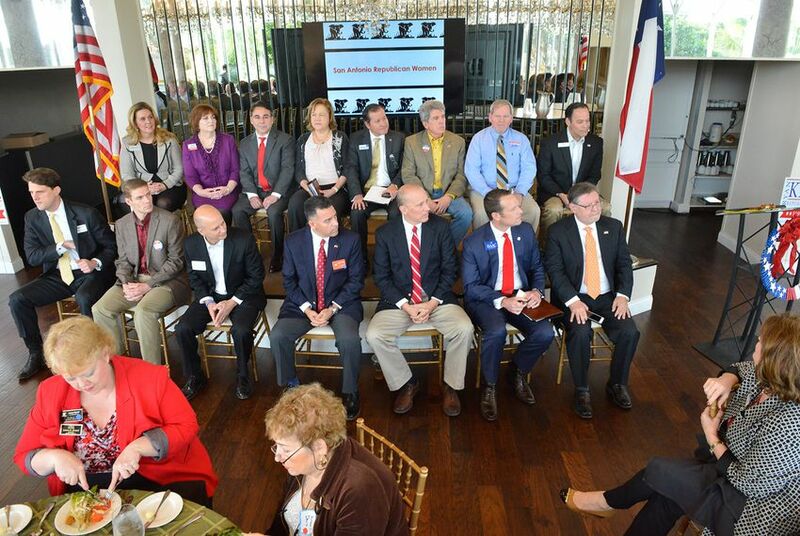 SAN ANTONIO — It looked more like a class photo was underway than a candidate forum as 15 Republicans running for Texas' 21st Congressional District took their places here last week, filling two rows of fold-up chairs. The introductions alone — each candidate got a minute — took up a sizable chunk of the event at the Old San Francisco Steakhouse. And that wasn't even all of them — three couldn't make it. In some ways, the primary for the seat being vacated by retiring U.S. Rep. Lamar Smith, R-San Antonio, is not unlike other open-seat races this year in Texas, where the departures of longtime incumbents have given way to crowded contests to succeed them. Yet the 18-way scrum in TX-21 begs its own category — the closest thing to it among congressional races this year is the 11-candidate GOP race to replace retiring U.S. Rep. Joe Barton, R-Ennis. Smith is one of eight Texans in Congress not running for re-election in 2018, but none of those other open seats have drawn anything like the interest in his district, which runs from South Austin to San Antonio and extends westward into the Hill Country. That intense interest partly reflects decades of local pent-up political ambition. Smith was first elected in 1986 and, by and large, easily won re-election for the next 30 years. For the TX-21 candidates, the unusually crowded Republican primary, combined with an election calendar that will see Texas primary voters begin casting ballots in just a month, has created an early urgency to build a distinct appeal — or else get left behind in a free-for-all battle for political oxygen. "This is the first time that any of us have ever seen this many candidates in a race, and of course, most of them are completely unknown," said Ruth Pharis, the chairwoman of the Comal County Republican Party, which has arranged for two separate forums in the coming weeks to deal with the massive field. "A few we are familiar with just because name recognition mainly, but many of them ... we’ve never seen, have no idea what their qualifications are." That's where candidates like William Negley come in. Negley, who hails from a prestigious family and has already locked down the support of Texas GOP megadonor Red McCombs, is leaning hard on his experience as a CIA agent in Afghanistan as he seeks to stand out in the crowded filed. His yard signs carry a punchy label that's fit for an 18-way primary where standing out is key: "Terrorist hunter." "It goes without saying that if any of us are unable to break out or distinguish ourselves, then it's going to be for naught," Negley said in an interview after the forum. "I would say that we are pretty squarely focused on the issues that deeply matter to me. My background, my experience, the issues that I have worked stand relatively unique in this field." Unsurprisingly, Nelgey is not the only one claiming that in the wide-open field. Yet he is seen as one of the more serious contenders along with at least three others: state Rep. Jason Isaac of Dripping Springs; Chip Roy, the former chief of staff to U.S. Sen. Ted Cruz; and Robert Stovall, the former chairman of the Bexar County GOP. Then there are a few who started the race with a healthy measure of name recognition because they have previously appeared on a ballot in the region — most notably, former U.S. Rep. Francisco "Quico" Canseco, who represented the nearby 23rd District from 2011 to 2013 and has run for it four times in a row. There's also Matt McCall, who ran against Smith in the two most recent elections and lost each time, and Susan Narvaiz, who unsuccessfully challenged U.S. Rep. Lloyd Doggett, D-Austin, in 2016, 2014 and 2012. That's just seven candidates. Most of the other 11 appear to face a steeper climb to making an all-but-certain runoff, let alone going all the way, according to Republicans watching the race — but anything is possible in an 18-way primary. Some say it could come down to variables as random as ballot placement — something Stovall seemed to have a passing awareness of when it was finally his turn to speak at the forum. "My name is Robert Stovall, and I am No. 18 on the ballot," Stovall, seated on the edge of the stage, said to laughs. The race will receive some clarity at the end of the month, when the candidates are required to disclose their campaign finances to the Federal Ethics Commission for the fourth quarter of 2017 — the period when most of them joined the race. Roy appears to be the only contender who has volunteered his numbers ahead of time, recently telling donors he raised over $200,000 in the first few weeks of his campaign. In the meantime, the forum, hosted by the San Antonio Republican Women's Club, offered ample opportunities to see the fault lines among the 18 contenders. There were jabs over several candidates not living in the district and an allegation that some candidates are uninterested in terms limits and only "vying to be the next 20-year incumbent." Yet the real divides have been simmering in the background for weeks, where at least two figures far better known than any of the 18 hopefuls have taken center stage: Cruz and President Donald Trump. Roy was endorsed by Cruz the day after he announced his candidacy, and that’s unlikely to be the end of the senator’s involvement in race. The senator and his dad, Rafael Cruz, are expected to campaign in the district for Roy and cut radio ads for him as their schedule allows, according to Roy’s campaign. At the forum, Roy teed up the choice for primary voters with a question straight out of his old boss’ political playbook. Trump has factored prominently into the bid by Stovall, who looks to be positioning himself as the most ardent supporter of Trump among the 18 candidates. Stovall, whose remarks at the forum included praise for Trump's talk of "draining the swamp," is receiving assistance from Brad Parscale, a fellow San Antonian who was digital director of Trump's campaign and remains involved in the president's political operation. Parscale, who’s headlining an upcoming Stovall fundraiser, has wasted little time contrasting his candidate with any rival who makes a claim to the Trump mantle. In particular, Parscale has objected to Isaac’s use of Trumpian messaging — “Make America Like Texas,” his campaign swag reads — ahead of a February fundraiser that’s being hosted for him by Karl Rove, the Trump-critical GOP strategist. Isaac, for his part, has sought to keep focus on his legislative record — a unique quality in a field that doesn't feature any other current elected officials. But in an interview, he didn't shy away from suggesting contrasts with some of his more high-profile rivals, including Roy, a longtime adviser to Republican officials. “A couple of the prominent candidates have lived off of and made their living off that public government sector, and that’s something I’ve never done,” said Isaac, a transportation consultant who's served in the House since 2011. “I’ve always been an outsider, not an insider." The other 11 GOP candidates are Eric Burkhart — who had been running for the seat before Smith announced his retirement — Samuel Temple, Ivan Andarza, Al Poteet, Ryan Krause, Foster Hagen, Jenifer Sarver, Peggy Wardlaw, Mauro Garza, Anthony White and Autry Pruitt. Whoever wins the Republican primary for the 21st District will not have a clear path to victory in November. For several months — long before Smith announced his retirement — four Democrats have been running for the seat. The expectation last summer was the winner would run a race focused on Smith, who has drawn national scorn from the left for his outspoken questioning of the science behind climate change. Now that Smith has bowed out, the candidates are stressing the rare wide-open nature of the race in an election year that many expect to be overall a good one for Democrats. 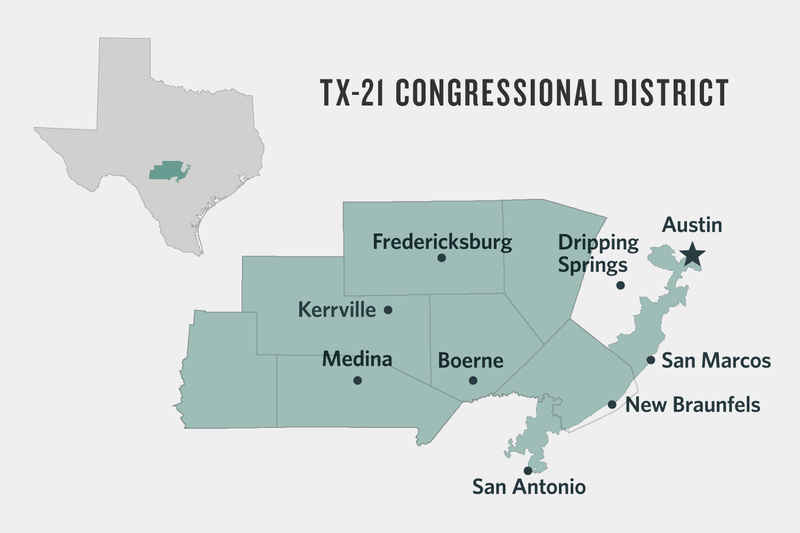 That dynamic led the Democratic Congressional Campaign Committee to add TX-21 to its target list — which already included three other districts in Texas — after Smith said he was not running for re-election. "We pushed a three-decade incumbent and committee chair out of this race," Democrat Joseph Kopser wrote in a recent fundraising email to supporters. "One poll had us within single digits. It hasn’t been this close since 1978." Disclosure: Red McCombs' family foundation, the McCombs Foundation, has been a financial supporter of The Texas Tribune. Jenifer Sarver, Karl Rove and Joseph Kopser have also been financial supporters. A complete list of Tribune donors and sponsors can be viewed here.